On Thursday & Friday of this week, we got walloped again with another snowstorm. 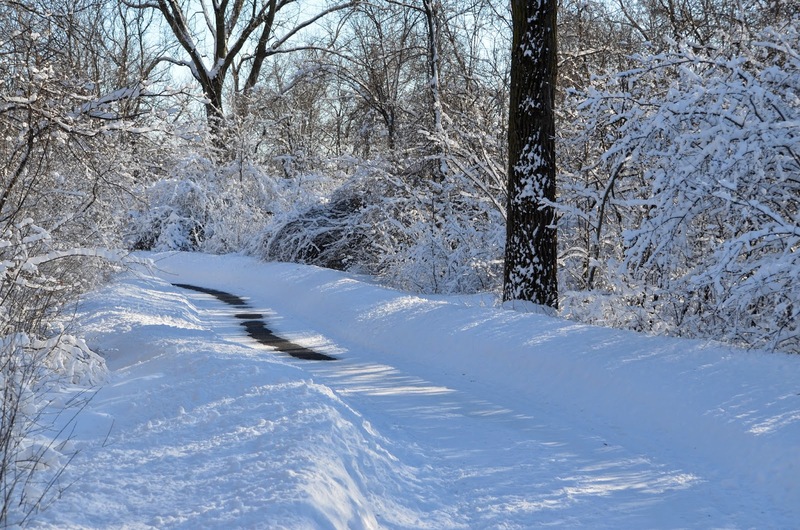 Some predictions were saying it might be the single largest snowfall of the season. As if we need any more snow! I don't remember what the actual total was but I'm guessing it was somewhere around 7 - 9 inches. Neighbors have been plowing and digging out all weekend and the snowbanks are becoming increasingly difficult to see over at intersections. After I finally got my own driveway cleared I was able to get to the park on Sunday. Heavy, wet and sticky snow still clung to everything days later and it seems every little twig in the park has expanded to double it's girth. Snow like this can dramatically change the landscape and the look of things and it was just interesting to look at. Birds were somewhat scarce today other than the usual Juncos, Cardinals and a few Woodpeckers. I did watch a Chickadee very closely as it inspected the end of a broken off branch –probably for some kind of food. Later in the same area I thought I noticed some movement in the thickly coated shrubs. 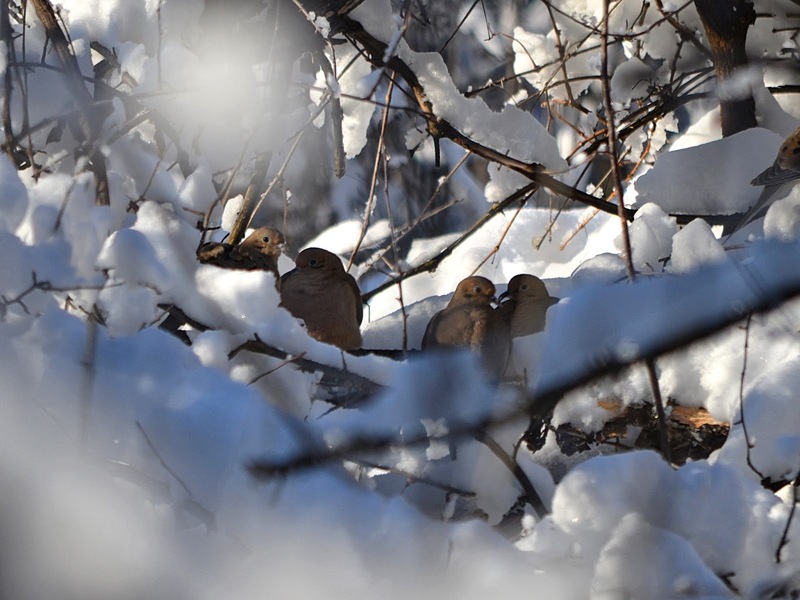 When I peered in I could see a group of Mourning Doves huddled together under the new white canopy of snow. I really wanted to get in closer for a better pic but stepping off of the trail meant falling into snow up to my waist! 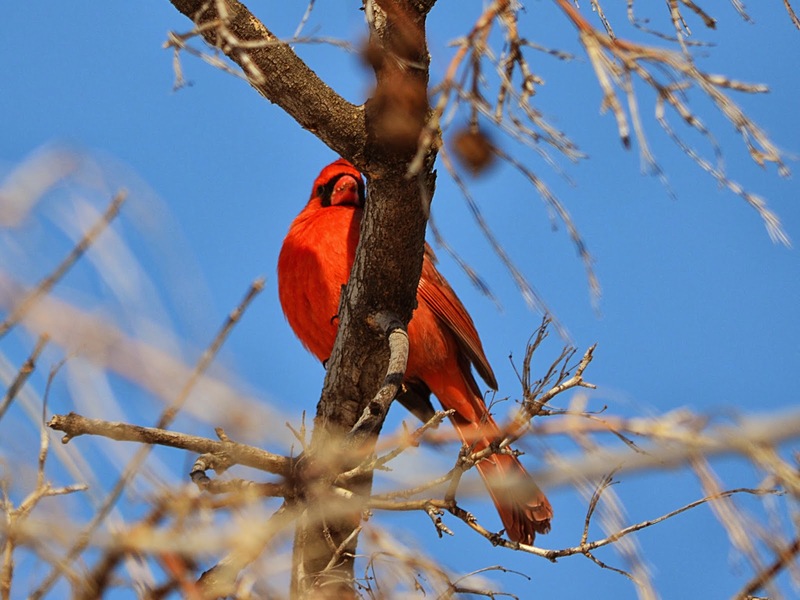 Somewhere on the west side I stopped to watch a few Northern Cardinals and admire their red color against the clear blue sky. This Saturday morning I had an extra reason to hike around the park. Yesterday through Monday is the annual 2014 Great Backyard Bird Count. This count is a joint venture between the Cornell Lab of Ornithology, The Audubon Society and Bird Studies Canada. Furthermore it is powered by a widely used online reporting website called ebird. Since becoming a full-fledged bird geek in recent years, I've participated in both this count as well as what is called the annual "Christmas Bird Count." I've gotta say that I prefer the Great Backyard Bird Count or "GBBC" as it is just all around an easier commitment to make. Whereas with the Christmas Bird count you are encouraged to go out in groups, cover a LOT of ground –much of it by car– AND have a designated expert in identification among your group, the GBBC essentially lets you do everything on your own. You can cover as little or as much ground you like, and in fact you could do it from your window without even leaving home! So for at least one day a year in February, I like to be a little more fastidious when I'm out bird watching so that I can report my results. I did have a little help from a friend today in doing so, though we didn't make it all the way around the park. With the temp being at only 5 degrees above zero, and with my lower back still bothering me, we only hiked about half the trails. Probably the highlight though was a Hawk that we spotted not too far in from the trail. 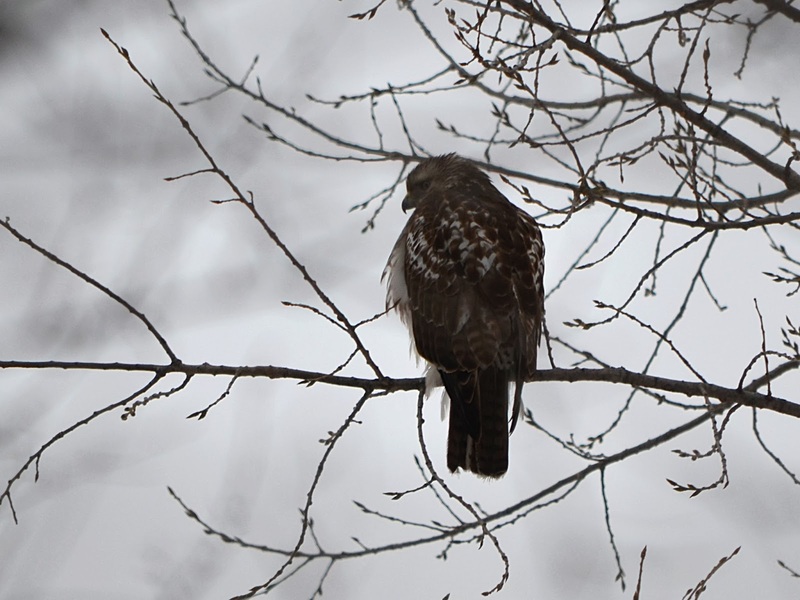 At first I thought this was a Red-tailed Hawk but upon closer look and seeing a long, bared tail we concluded it is a Cooper's Hawk. We also saw a fairly large flock of House Finches in the same area and were wondering if maybe the Hawk was watching them as well. The other most interesting thing we spotted could unfortunately not be counted as it was dead! Some time earlier another park goer stopped to ask us "what kind of feathers were these?" We both thought they looked like Pheasant feathers. Then later we started noticing more similar feathers laying on the trail. My friend then spotted a dark spot about 10 feet off the trail. 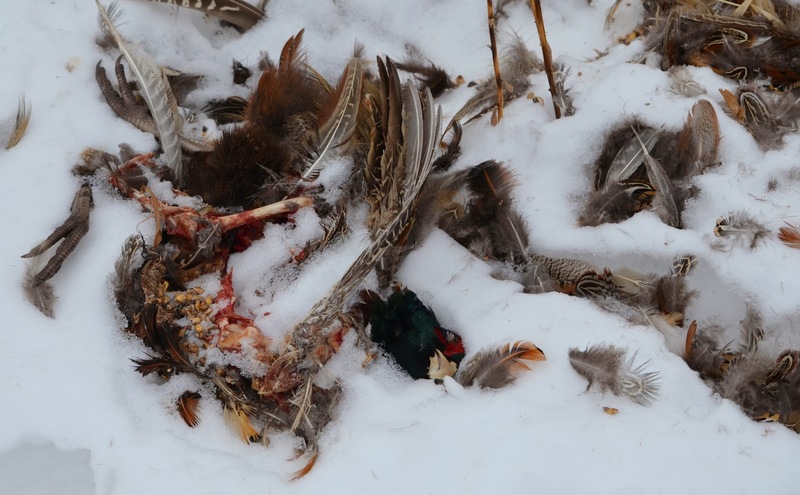 There laying mangled in the snow was indeed a rooster Pheasant. Our first though was that it was likely attacked by a Great Horned Owl. So we looked for "wingtip imprints" in the snow and sure enough there they were. These are hard to take a photo of and so I passed on that. But I do have some photos of it here in an older blog entry. Whatever did kill this Pheasant didn't stick around long enough to consume everything it could. There was lots of it left. This is kind of a disturbing photo, but you can see some of what the Pheasant had eaten in it's lifetime. Following is our bird count report submitted to ebird.org. Due to our recent long-running cold snap, I've often been waiting until the afternoon to go around the park. It helps some as the temps can at least crawl into the teens instead of single digits above zero! I also tried to change things up today by walking the opposite direction of what I normally do. The sky was overcast today giving me hopes that I might spot an Owl but I had no such luck. There was a kind of bird "hot spot" that I came across on the north side where someone had dumped a handful of field corn. There were quite a few Cardinals here, perched in the trees above and waiting their turn to swoop down and steal a piece. I thought I might finally get a good Cardinal shot this way but they still spooked when I went in close. As I waited there were both Downy and Red-bellied Woodpeckers flying back and forth above me. They had no interest in the corn as they continued to hammer at the trees looking for insects of some kind. 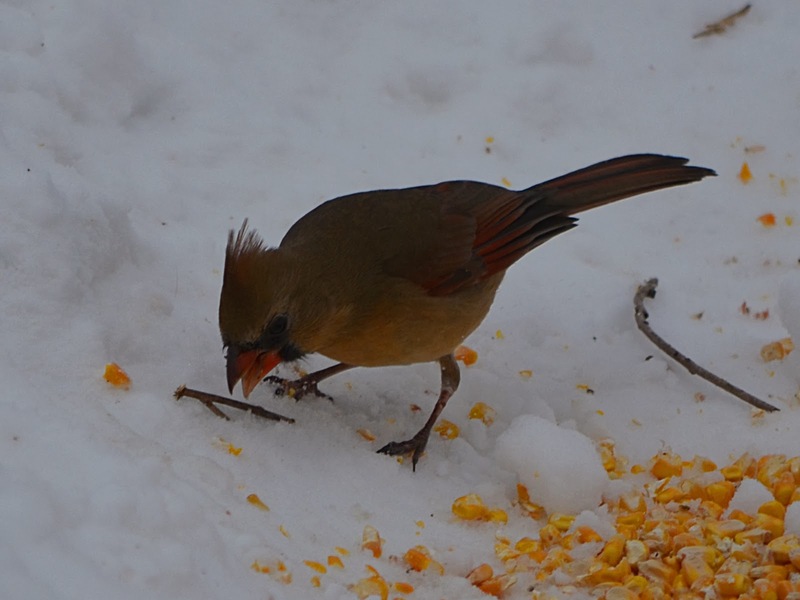 Finally this female Cardinal came in for a bite. Later near the southeast side before the duck pond, I noticed a group of Sparrows in some bushes right off the trail. At first glance most appeared to be Tree Sparrows but then I realized there was something different in there. They turned out to be House Sparrows. I have oodles of these in my own back yard but rarely do I see them at PLP. I just read recently that both European Starlings and House Sparrows will intentionally destroy eggs AND even peck to death other species of baby songbirds such as Bluebirds. 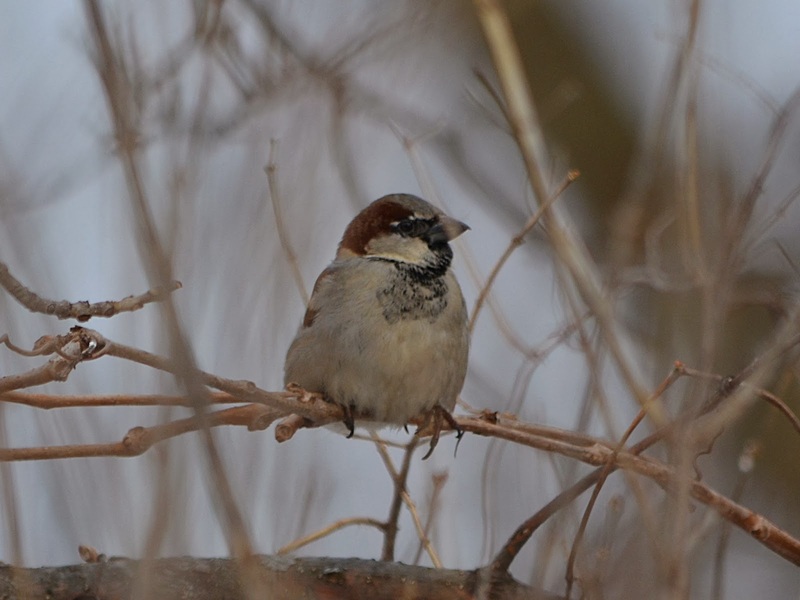 This is why the House Sparrow is generally considered a "nuisance bird." From here I could already hear the Mallards and wondered how many were there today. As expected there had to be somewhere close to 200 in the same place, keeping the water from freezing over. 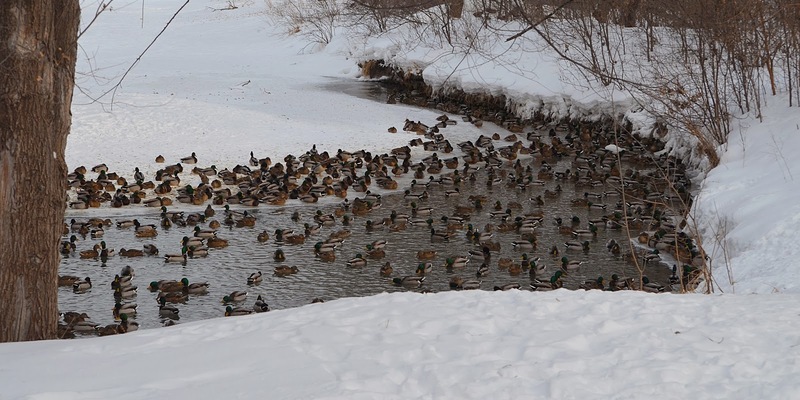 This is the very reason I refer to the area as 'the Duck Pond." It is sometimes fun to sit and look carefully among the group for species other than Mallard. This is how I first became aware of a single Gadwall that had joined the group in past years. I can tell that other park goers have been feeding them as when I approach the group they actually fly up the bank and come right too me. More on that in a future post! After I moved on and was making my way through the snow trampled wood chip trails, I noticed a solitary bird perched up in the top of a tree overlooking the center of the park. I actually didn't give it too much thought, but then realized quickly what it might be. 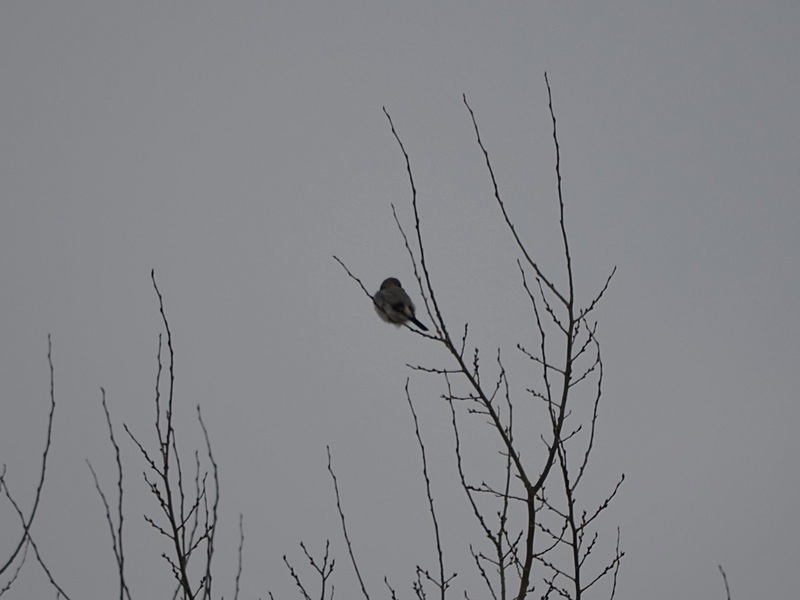 Indeed it was a Northern Shrike and I've not seen one for at least a month I think! Of course he was way off the trail so I decided to hike through the snow to get closer. I quickly learned just how deep the snow was as I sunk up to my knees with every step. I only made it about half the proximity I had intended before the Shrike flew off. Unfortunately this was the best photo I got, with it facing away from me. Oh, I also later spotted a handful of Robins perched in similar fashion near the tops of the trees. As I hiked around the park this Saturday afternoon, it seemed there was a little glimmer of hope among this harsh winter. Today was a new month with January behind us, and the sun had even poked it's head out. Each day it is up longer and longer and even now I can sense a difference in the time of year without looking at the calendar. 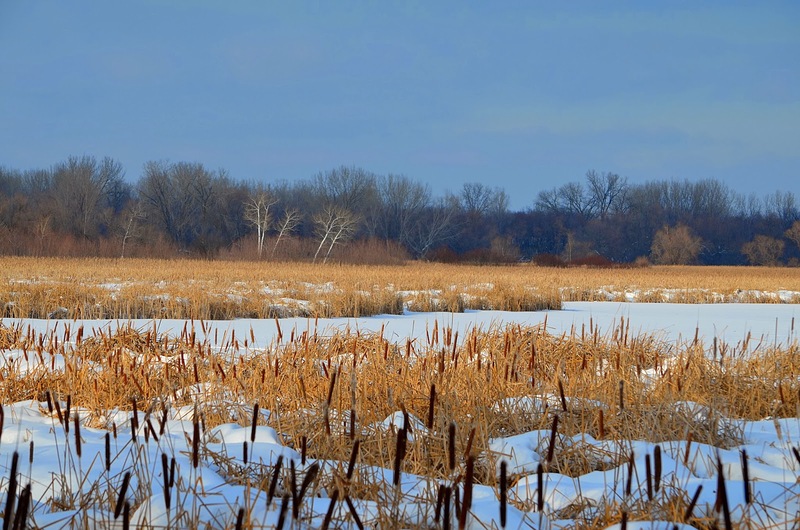 As I made my way around the south end of the park the sun cast a warm glow out onto the lake area and cattails and even the thin white Aspen (?) trees out near the middle. Sometimes just a different light source can really change your whole view of how something looks –thus I thought this was kind of an interesting photo to share from today. The birds were few and far between today and I only spotted a handful of common species including Black-capped Chickadee and both Downy and Red-bellied Woodpeckers. 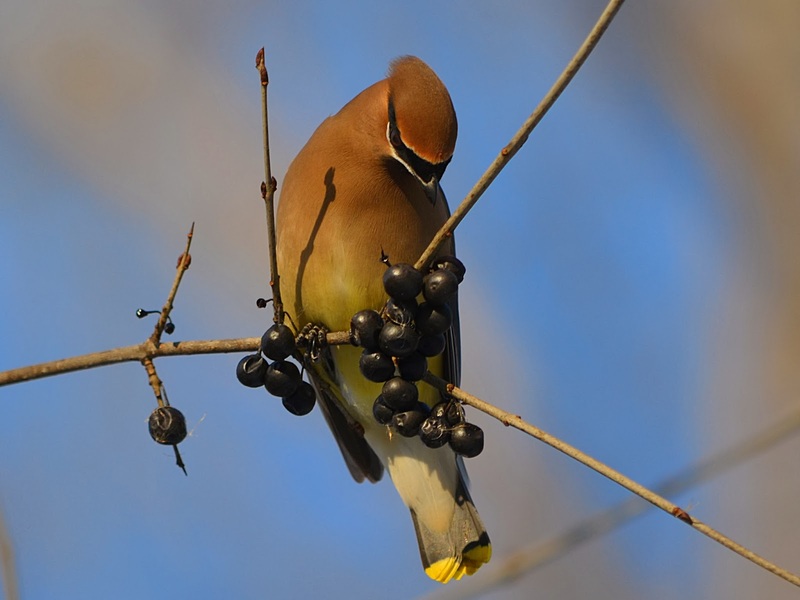 But I again found a flock of 15-20 Cedar Waxwings who were busily gulping down Buckthorn berries. The sun was just perfect and with a partly blue sky behind I snuck in closely to a few who tolerated me better and snapped a bunch of pics. I was pleasantly satisfied with a number of them including this one that I'm actually proud of. In fact I decided to submit it to the Capture Minnesota online photo contest! It is a really fun way to share and look at others photos and definitely inspiring.